Octavia E Butler had a vision of time as circular, giving meaning to acts of courage and persistence. In the face of social and environmental injustice, setbacks are guaranteed, no gains are made or held without struggle, but societal woes will pass and our time will come again. In this sense, history offers solace, inspiration, and perhaps even a prediction of what to prepare for. 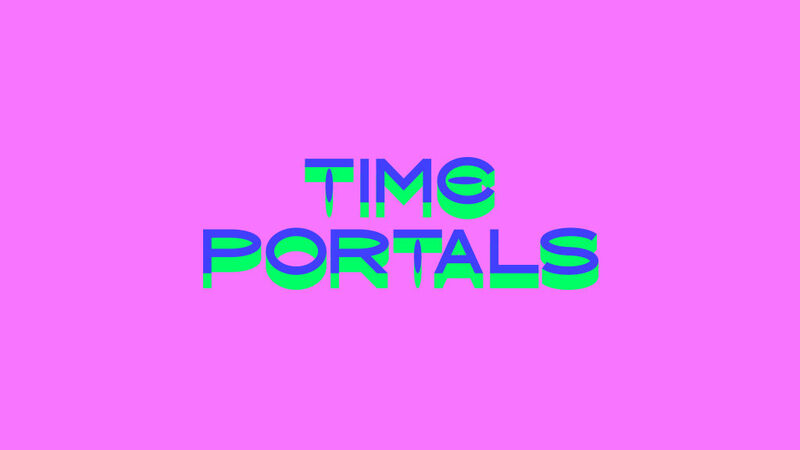 The Time Portals exhibition, at Furtherfield Gallery and online spaces, celebrates the 150th anniversary of Finsbury Park. As one of London’s first ‘People’s Parks’, designed for free movement and thought, it is the perfect location to create a mass investigation of radical pasts and futures, circling back to the start as we move forwards. Each artwork invites audience participation – either in its creation or in the development of a parallel ‘people’s’ work – turning every idea into a portal to countless more imaginings of past and future urban green spaces and beyond. An interactive wall depicting the urban green space of Finsbury Park as a machine for radical re-assemblage. The external billboard can be scanned with an Augmented Reality app to reveal the secret of realising progressive visions for the future. Scan the message in the Gallery to see the billboard image animated. An interactive machine designed and built to respond to environmental change and inspire new rites for our troubled times. A slideshow of the machine as it is imagined and built will be presented alongside a ritualised unveiling in the Autumn. 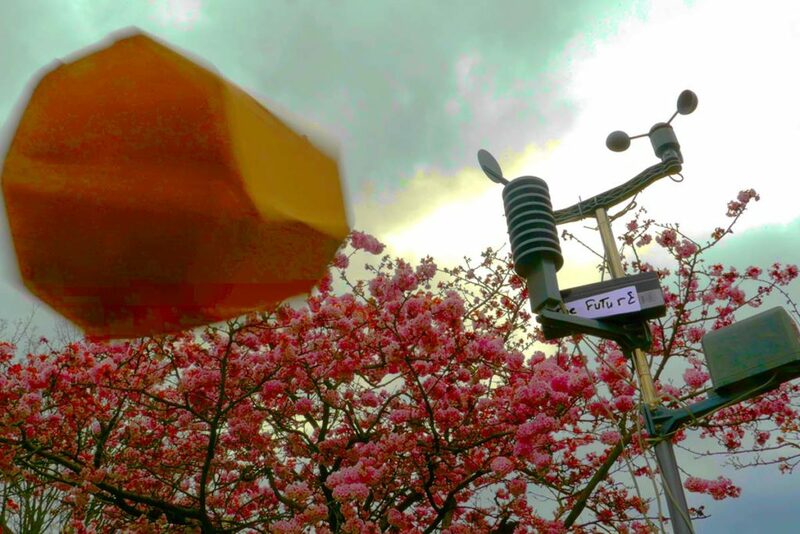 Join the Future Machine design team at Furtherfield Commons in Finsbury Park to build a new artwork that will help us to respond to environmental change…as the future unfolds. Sign up to take part in up to 4 workshops that involve talking, thinking & making, using interactive technology and scientific sensors, helping to design and build the Future Machine itself. 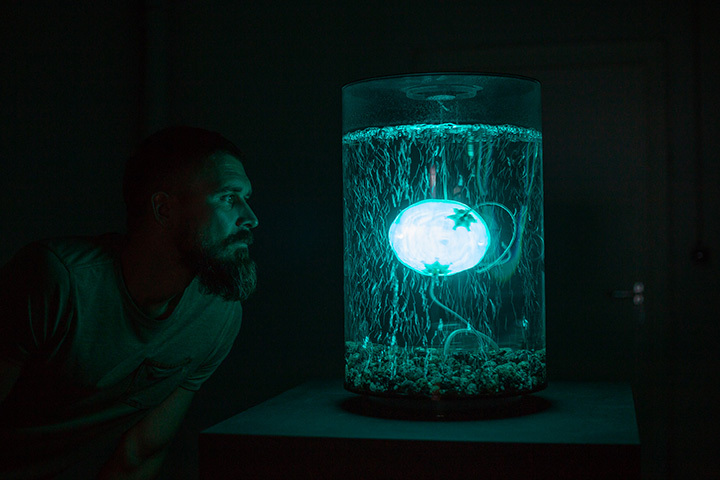 An underwater robotic installation which explores what ‘life’ might mean in a future transformed by climate change and artificial intelligence. The work is based on new research into archaea, which are single-celled, ancient microbes that can survive in hot, polluted environments, combined with the latest innovations in machine learning. Now living at Furtherfield Gallery the “ArchaeaBot” is the ‘ultimate’ species for the end of the world as we know it. Photo credit: ArchaeaBot by Anna Dumitriu and Alex May. Photo by Vanessa Graf. Through in-depth research James revisits a historical black woman who lived in the Finsbury Park area 150 years ago, embodies and reimagines her then and 150 years into the future. Produced by hybrid reality technologist Carl Smith and broadcast as a hologram inside the Furtherfield Gallery throughout the summer. 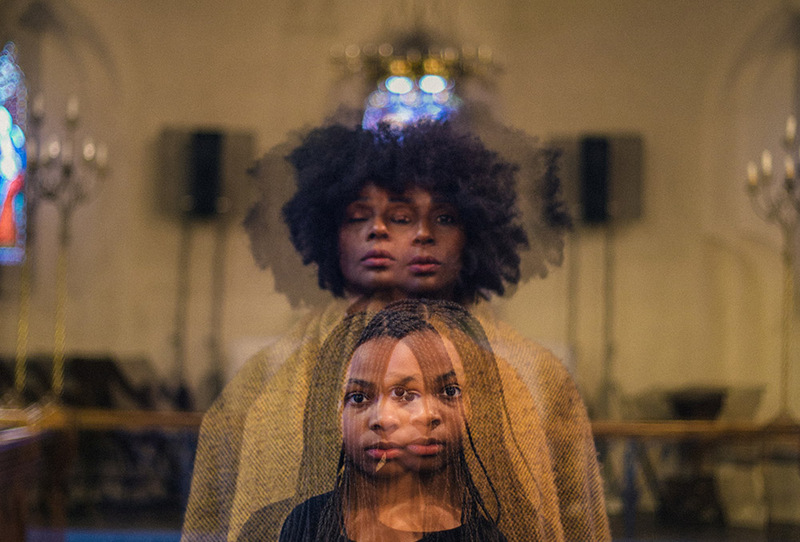 Photo credit: Image from ‘Forgotten black Essex’ by Elsa James, photo by Amaal Said. This video work is a complete rendition of the 1960s film version of HG Wells Novella re-edited by Thomson & Craighead into alphabetical order from beginning to end. In doing this, the artists attempt to perform a kind of time travel on the movie’s original timeline through the use of a system of classification. 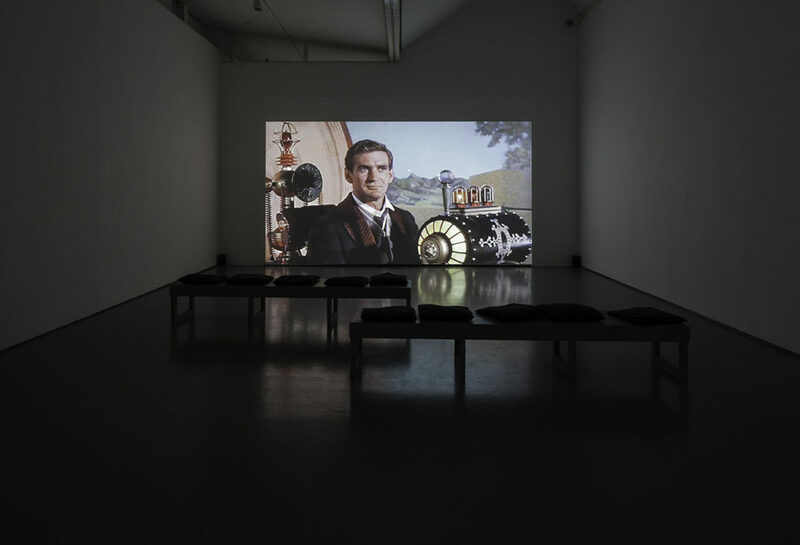 Photo credit: Thomson & Craighead, 2010, The Time Machine in alphabetical order, Modified feature length movie. Photo by Ruth Clark. This 3-year programme combines citizen science and citizen journalism by crowdsourcing the imagination of local park users and community groups to create new visions and models of stewardship for public, urban green space. By connecting these with international communities of artists, techies and thinkers we are co-curating labs, workshops, exhibitions and Summer Fairs as a way to grow a new breed of shared culture. Stories, movies, machines and more! #CitSciFi – crowdsourcing creative and technological visions of our communities and public spaces, together. Anna Dumitriu is a British artist who works with BioArt, sculpture, installation, and digital media to explore our relationship to infectious diseases, synthetic biology and robotics. She has an extensive international exhibition profile including ZKM, Ars Electronica, BOZAR, The Picasso Museum, The V & A Museum, Philadelphia Science Center, MOCA Taipei, LABoral, Art Laboratory Berlin, and The Museum of the History of Science Oxford. She was the 2018 President of the Science and the Arts section of the British Science Association and holds visiting research fellowships at the University of Hertfordshire, Brighton and Sussex Medical School, and Waag Society, as well as artist-in-residence roles with the Modernising Medical Microbiology Project at the University of Oxford, and with the National Collection of Type Cultures at Public Health England. Dumitriu is a renowned speaker and has presented her work at venues including TATE Modern, Princeton University, Imperial College, La Musee de la Chasse et de la Nature, The Mendel Museum and UCLA. Her work is featured in many books including “Bio Art: Altered Realities” published by Thames and Hudson in 2016 and many other significant publications across contemporary art and science including Artforum International Magazine, Leonardo Journal, The Art Newspaper, Art Quarterly, Nature and The Lancet. Dumitriu’s work has a strong focus on the ethical implications of emerging technologies drawing threads across time, exploring future scenarios by reflecting on the past. Elsa James is a visual artist, activist and producer based in Southend-on-Sea, Essex, who grew up in west London during the 1970s and ’80s. Her solo practice encompasses lens-based performance, language and text, and recently the use of aural and the archive to explore regionality of race; black subjectivity; and the historical, temporal and spatial dimensions of what it means to be black in Britain. She is currently developing work exploring alienation and outsiderness experienced as a black woman living in Essex since 1999. Forgotten Black Essex (2018) embodies two place-specific narratives from our national archives of two overlooked, under-researched and recognised black women in Essex. Her social practice includes advocating for the inclusion of marginalised communities in the arts sector. New Ways of Seeing, Telling and Making (2018), a visual provocation and participatory lab at the Social Art Summit, asked questions about how we can ‘genuinely’ address barriers to participation and involvement in the arts for BAME communities. In 2015 she was commissioned to research the asylum and refugee community in Southend. This culminated in a 38-page report exposing the council’s lack of provision for the needs of asylum seekers, failed asylum seekers and refugees living in Southend. Rachel Jacobs is an artist, researcher and games designer. She co-founded the artist-led collective Active Ingredient in 1996 and the commercial games company Mudlark Production Company in 2007. She completed a Doctorate in Computer Science in 2014. Rachel is a practising artist exhibiting nationally and internationally, and a Research Associate at the Horizon Digital Economy Institute, University of Nottingham. Her artworks include the award winning ‘Heartlands (Ere Be Dragons)’ one of the first mobile games that took place on city streets in Sao Paulo, Yokhama, Berlin, Paris, Cambridge, Bristol and Nottingham; ‘A Conversation Between Trees’, a touring artwork and schools exchange using environmental sensors to connect forests in the UK and Brazil; and ‘The Prediction Machine’, an interactive installation that predicts the future impacted by climate change. Rachel is currently developing a series of artists interventions ‘Creating Rituals for When The Future Comes’, alongside a mobile interactive artwork the ‘Future Machine’. Marius Matesan is creating narratives using real and virtual installation art, noted mostly for his work on theatre stages across Europe and more recently for his Mixed Reality experiences. Mixing reality with the imaginary, using sound, projection mapping, spatial computing and virtual reality. His work revolves around pushing the boundaries of perception, awareness and reality, creating installations that are often addressing social issues with a psychedelic twist. 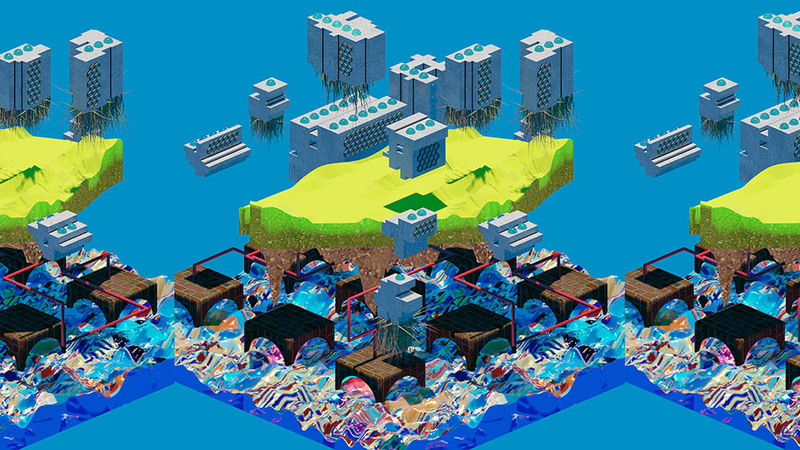 Alex May is a British artist creating digital technologies to challenge and augment physical and emotional human boundaries on a personal and societal level in a hyper-connected, software mediated, politically and environmentally unstable world. He works with light, code, and time; notably algorithmic photography, robotic artworks, video projection mapping installations, interactive and generative works, video sculpture, performance, and video art. Alex has exhibited internationally including at the Francis Crick Institute (permanent collection), Eden Project (permanent collection), Tate Modern, Ars Electronica (Austria), LABoral (Spain), the Victoria & Albert Museum, Royal Academy of Art, Wellcome Collection, Science Museum, Bletchley Park, One Canada Square in Canary Wharf, the Museum of Contemporary Art in Caracas (Venezuela), the Science Gallery in Dublin, Princeton University, University of Calgary (international visiting artist 2016), Texas A&M University, and the Beall Center for Art + Technology, University of California, Irvine. Alex is a Visiting Research Fellow: Artist in Residence with the School of Computer Science of University of Hertfordshire, and a Digital Media Arts MA sessional lecturer at the University of Brighton. Antonio Roberts is a new media artist and curator based in Birmingham, UK. He uses technology-driven processes to explore issues surrounding open source software, free culture and collaborative practices. His visual and performance work has been featured at galleries and festivals including databit.me in Arles, France (2012), Glitch Moment/ums at Furtherfield Gallery, London (2013), Loud Tate: Code at Tate Britain (2014), glitChicago at the Ukrainian Institute of Modern Art in Chicago, US (2014), Permission Taken at Birmingham Open Media and University of Birmingham (2015-2016), Common Property at Jerwood Visual Arts, London (2016), Green Man Festival, Wales (2017) and Barbican, London (2018). He has curated exhibitions and projects including GLI.TC/H Birmingham (2011), the Birmingham editions of Bring Your Own Beamer (2012, 2013), µChip 3 (2015), Stealth (2015), and No Copyright Infringement Intended (2017). Carl H Smith is Director of the Learning Technology Research Centre (LTRC) and Principal Research Fellow at Ravensbourne University London. His background is in Computer Science and Architecture. He has 17 years experience conducting R+D into the application of hybrid technologies for perceptual, cognitive and creative transformation. He has worked on a number of large-scale FP7 and Leonardo Life Long Learning European projects. He is currently working on 4 EU projects including the Horizon 2020 project ‘[WEKIT] Wearable Experience for Knowledge Intensive Training’ which aims to create ‘Wearable Experience (WE)’ – an entirely new form of media. His research interests include Embodied Cognition, Spatial Literacy, Perceptual Technology and Hyperhumanism. His other projects involve Context Engineering, Umwelt Hacking, Natural Media, Sensory Augmentation, Memory Palaces, Artificial Senses and Body Hacking. He is co-founder of the London Experimental Psychonautics Club and co-founder of the Cyberdelic Society. Both organisations explore the myriad of ways it is possible to produce and examine Altered States of Consciousness. He has previously worked at the Computing departments at London Metropolitan University, Glasgow University and Sheffield University. The Learning Technology Research Centre (LTRC) conducts design research into the application of information and communication technologies to augment, support and transform cognition. Studio Hyte is a London based multidisciplinary design studio who place research and concept above medium. Working between graphic design, interaction and emergent forms of visual communication, we aim to create meaningful and thought provoking work. Formed of a small group of individual practitioners, Studio Hyte is the middle ground where all of our interests and practices meet. As such our collective practice and research covers a broad spectrum of topics including; language, inclusion & accessibility, egalitarian politics & alternative protest and technology & the human. With an emphasis on process, we often create critical narratives through our work in order to conceptualise through making. Collectively, our visual practice is a means through which we can plot out a conceptual landscape in order to understand and explore real-world scenarios. Studio Hyte works on self-directed research projects, commissions and client-led projects for a small pool of like minded organisations and individuals. Chris Szkoda, Kaws Infinity – Games Designer/ VFX Artist, works on designing mixed/virtual reality apps for a social mixed reality experience playground at Ravensbourne University London. Keen to support social good & diversity projects, working directly with students and helping them make their creative ideas a reality. He has expertise in immersive technology, VR modelling and painting in Google Tilt Brush and MasterpieceVR software. Jon Thomson (b. 1969) and Alison Craighead (b. 1971) are artists living and working in London. They make artworks and installations for galleries and specific sites including online spaces. Much of their recent work looks at live networks like the web and how they are changing the way we all understand the world around us. Having both studied at Duncan of Jordanstone College of Art in Dundee, Jon is Reader in Fine Art at The Slade School of Fine Art, University College London, while Alison is a reader in contemporary art and visual culture at University of Westminster and lectures in Fine Art at Goldsmiths University.